On the hills above Khust. 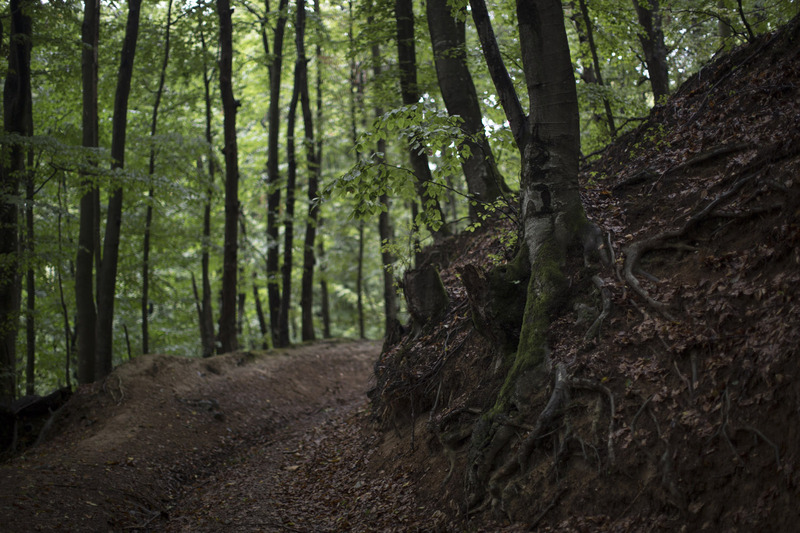 The dense forests and fertile valleys of the region were settled by Jews between the 17th and the 18th centuries, often at the invitation of local princes who granted them the right to own land and collect timber. Malkha peeling apples for the Rosh Hashana dinner, which marks the Jewish new year, at Mukacheve's other synagogue. 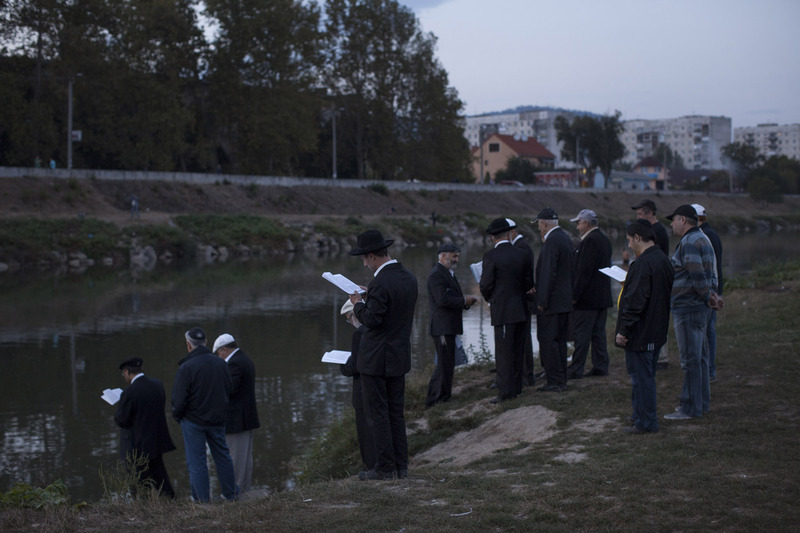 The rabbi of this community is no longer alive but its followers continue to gather, especially on Rosh Hashana, which is is celebrated with food, vodka and apples dipped in honey. 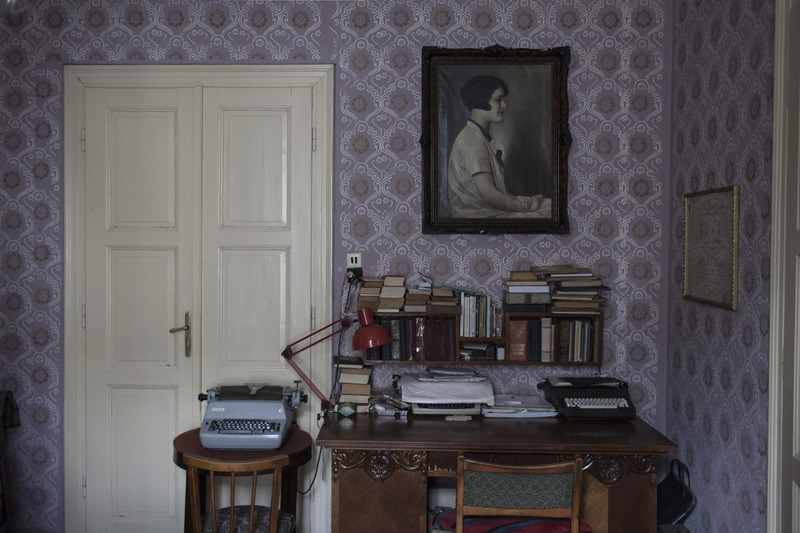 When the Jews of Khust were ordered to move into a ghetto, the Klein family fled into hiding in Budapest. 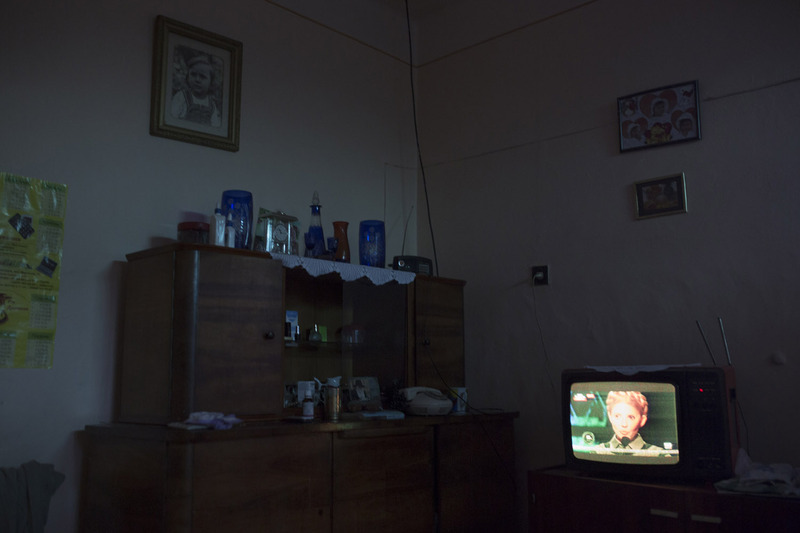 Upon their return they found their house still standing, and one of them still lives there, a portrait of his mother hanging in the living room. 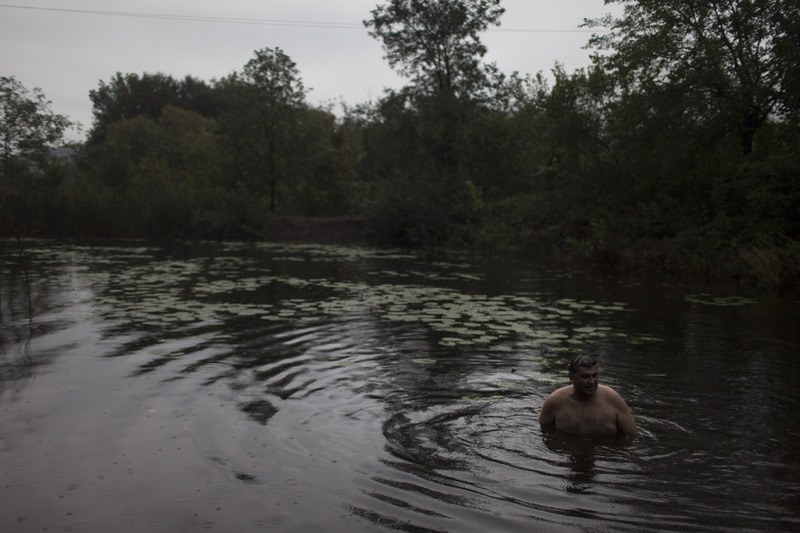 On a rainy and cold day, Vasily takes a dip in a small pond near his brother's house, which they use as a mikve (ritual bath) before the holidays. 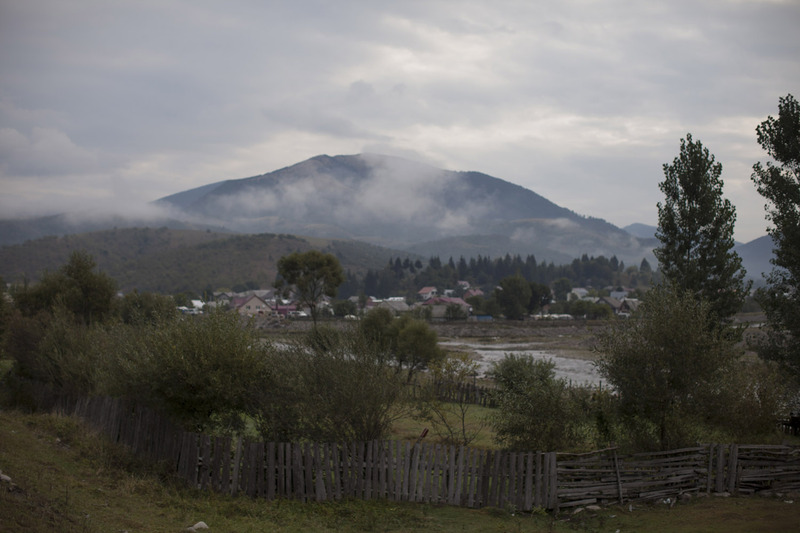 The village of Kolochava used to be home to a a few hundred Jews, living in wooden houses by the river. 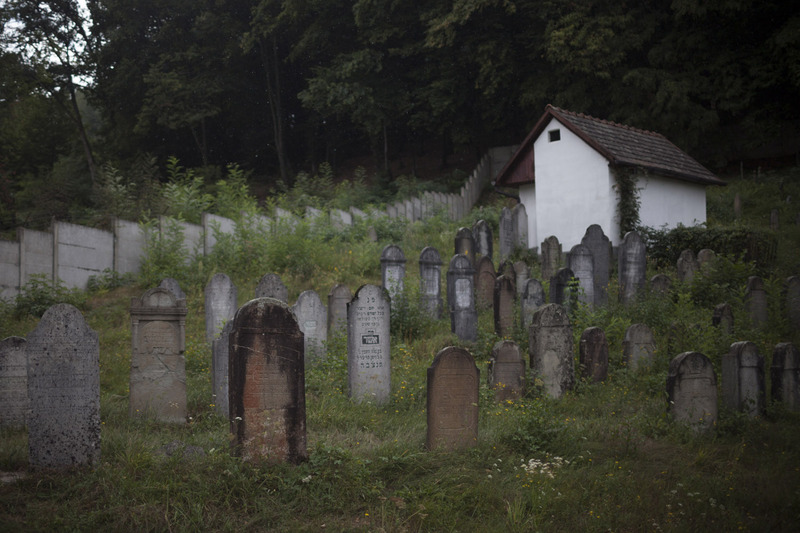 It all came to an end on a bright morning in late May 1944, when a column of Hungarian gendarmes drove into the village, with orders to take all the Jews away. Agricultural labourers wait for the bus home after a day of picking grapes at the farm of a Jewish landowner who produces Kosher wine. 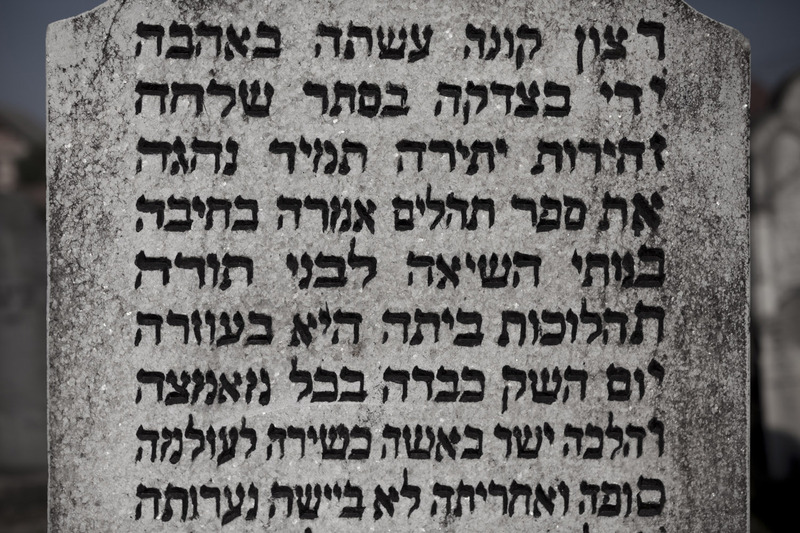 The Baal Shem Tov, a great Jewish mystic from the Carpathians, once came across a praying Jewish shepherd. “Master of the world”, he pleaded, “I am ignorant and poor, so please accept my only silver coin as a sign of my gratitude for creating me!”. As he threw it to the sky, the Baal Shem Tov saw a hand from heaven reach down to grab the coin. Klein was born in Khust in 1928, doesn't know of anybody who was born before the war and is still around. In life he learned five national anthems, and can sing them in their original languages: the one of Czechoslovakia, of the Carpatho-Ukraine republic, of Hungary, of the Soviet Union and of independent Ukraine. 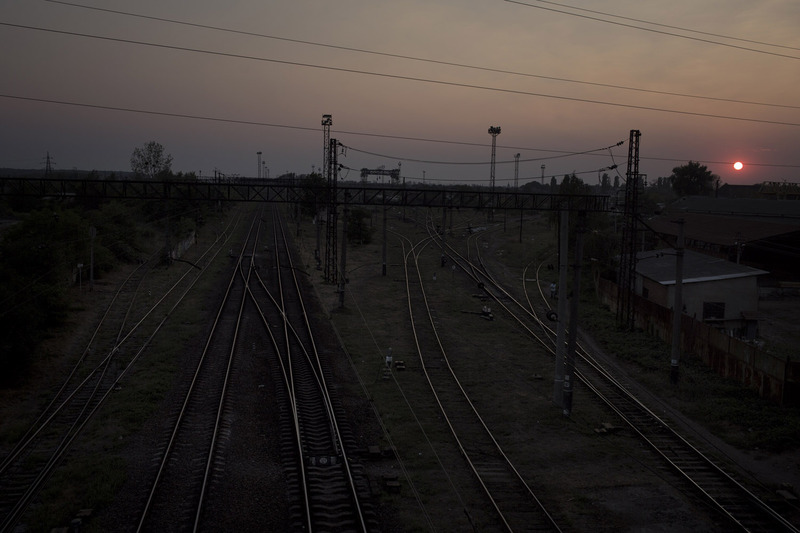 Over the course of ten days in May 1944, tens of thousands of Zakarpattian Jews were deported on these train tracks at Mukacheve's station, for a one-way journey to Auschwitz. 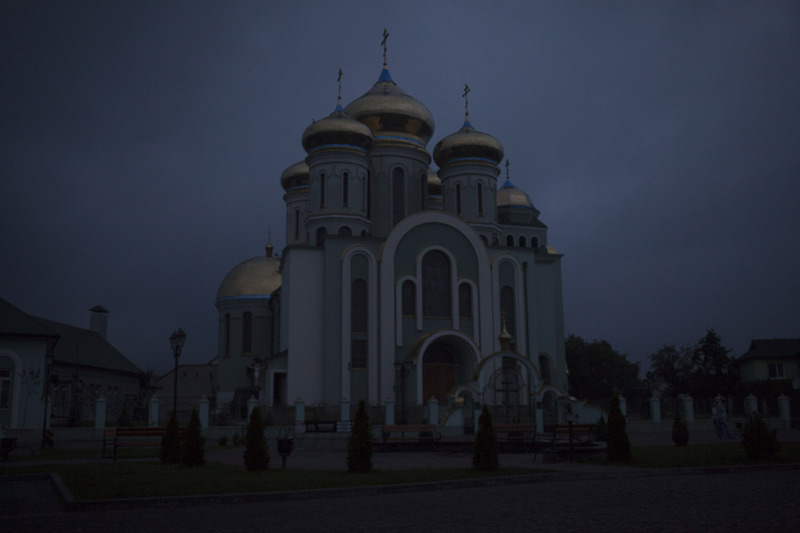 The Russian Orthodox church of Khust, just across the street from the town’s last remaining synagogue. 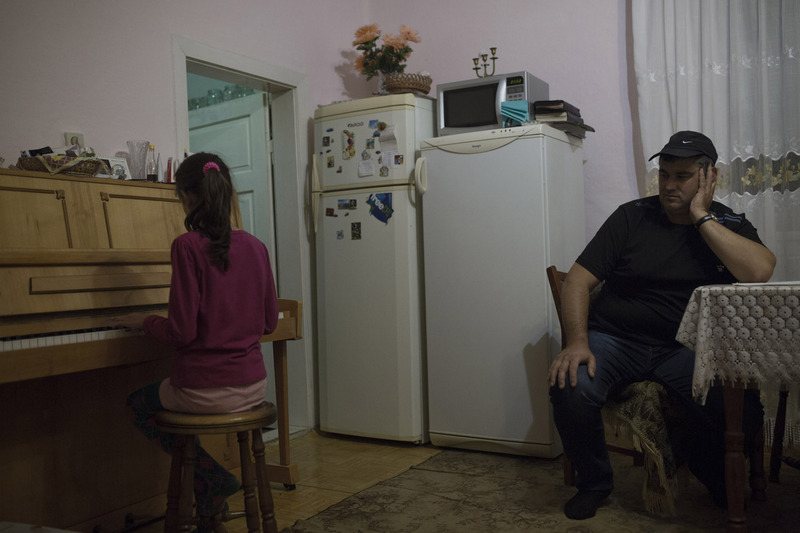 Vasily listens to his daughter Vera practising the piano in their home deep in the countryside near Khust. 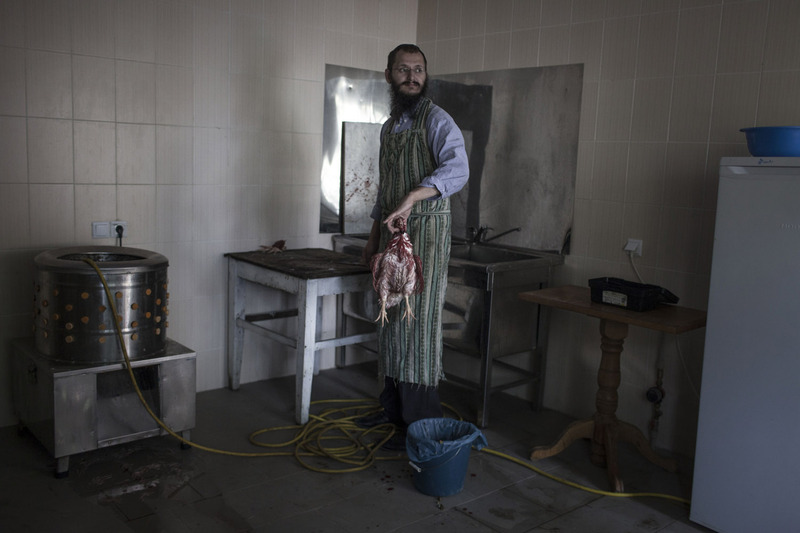 He only rediscovered his roots after neighbours told him that his grandparents were Jewish, and now tries to keep a kosher house, for example having two fridges, one for meat and one for milk products. Watching the news at Sonia’s house in Vinogradiv. 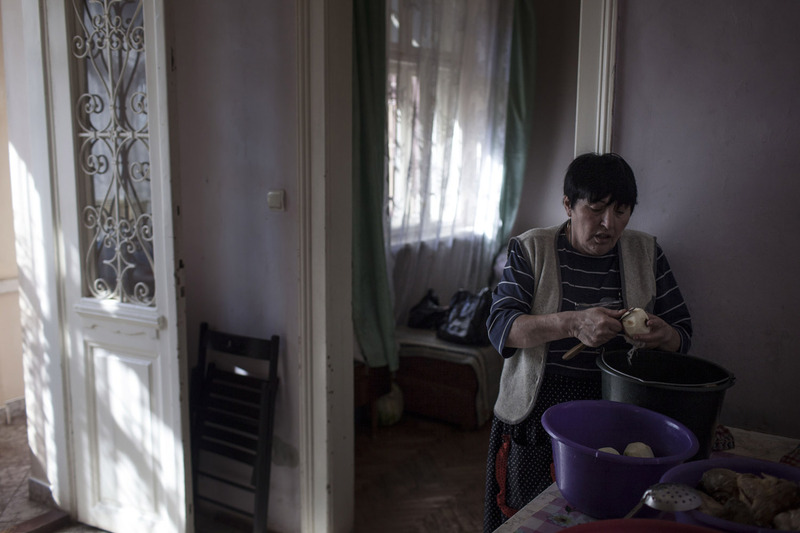 Like many of the Jews of Carpathia, she grew up in the Soviet Union and has little trust in contemporary Ukrainian politics. When asked about Gorbachev, she wouldn’t even answer. 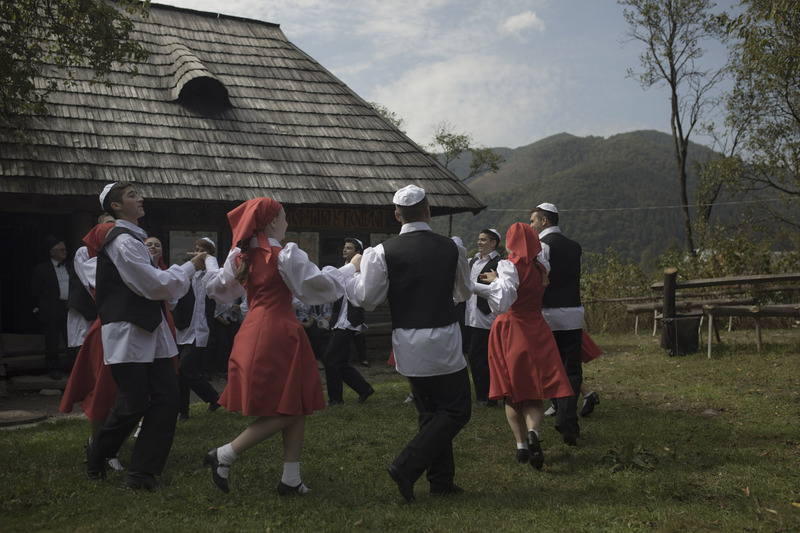 Jewish traditional dances at Kolochava’s Jewish Culture Festival, held in the local historical museum, which includes the reconstruction of a synagogue and of a certain Jewish-owned bar that apparently was the town’s main hangout spot. 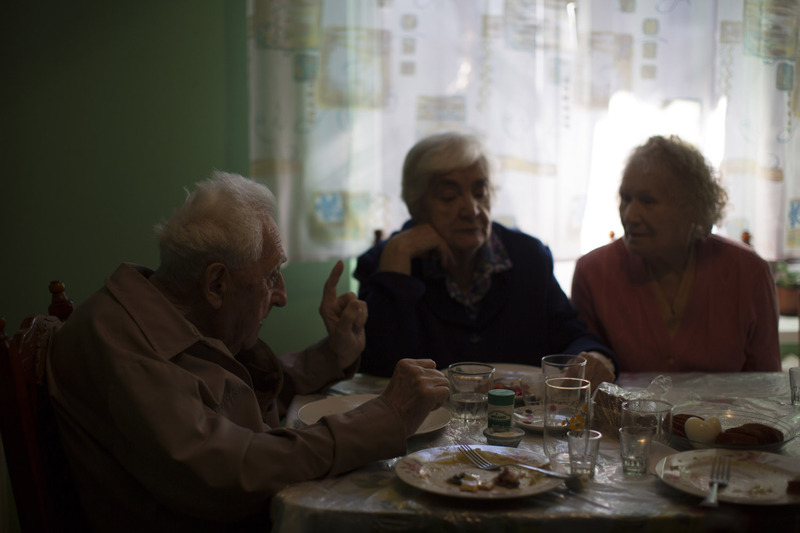 The “Club” of Khust, a weekly meeting of elderly Jews who gather to have breakfast and read the news together. Their main source is the town's last subscription to the Forverts (the Forward), a Jewish-American newspaper founded in 1897 to report on Jewish news, in Yiddish. Empty prayer stalls in the synagogue of Khust. 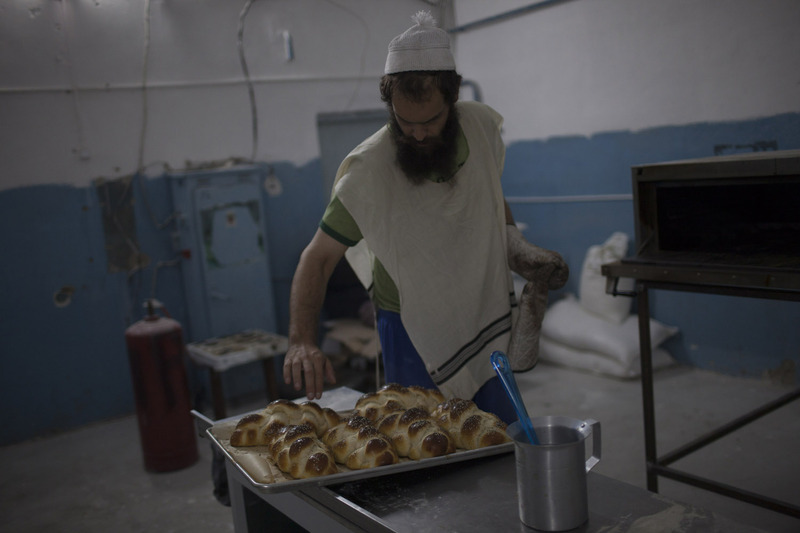 With great efforts, the community managed to restore the building and the interior is more or less intact, but there aren’t enough Jews to fill it, so the Jews of Khust find it less depressing to use a smaller side room instead. 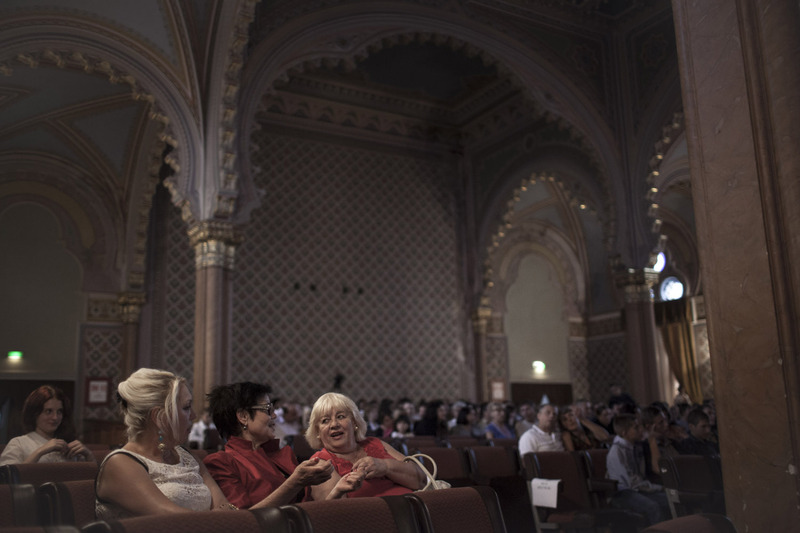 Listening to a classical concert in what used to be Uzhgorod's main synagogue, a grandiose oriental-style building that must have been able to accommodate hundreds of faithful. The office of Hesed Shapira, an organization devoted to sustain Jewish life in the region, and especially to offer care to elderly Jews. One of their most successful programs provides laptops and Skype accounts to keep in touch with distant relatives, many of whom live in Israel. 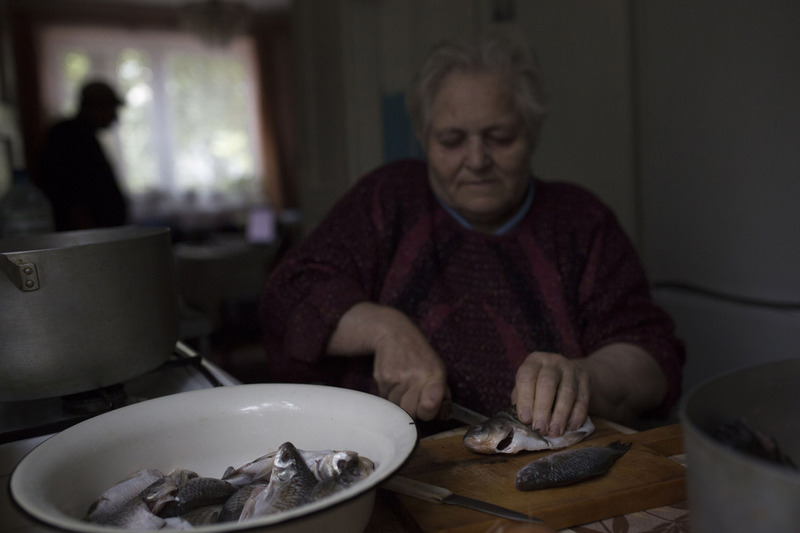 Vova's mother prepares gefilte fish, a traditional Jewish dish, at her home in Khust. Sonia welcoming the shabbat in her house in Vinogradiv. 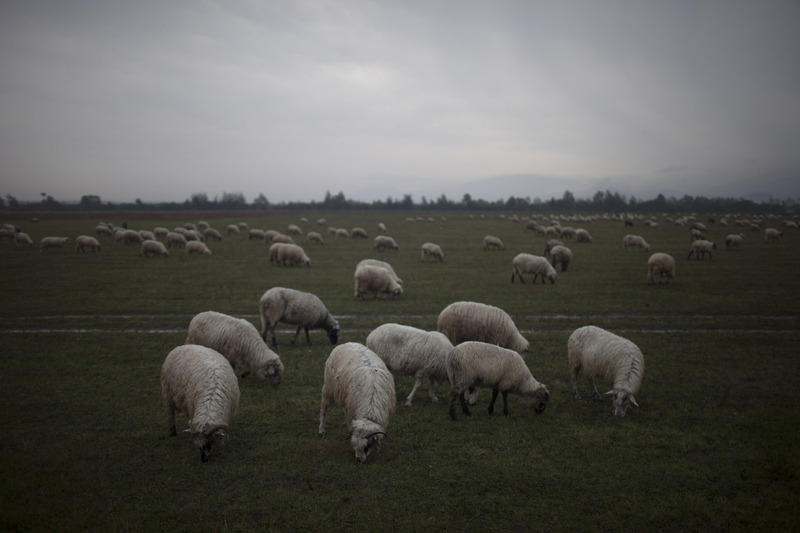 To those coming from the east, the hills and valleys between the Tisza river and the Carpathian mountains are known as Transcarpathia, the Ukrainian name of the province which means “the land beyond the mountains”, while those who live to the west call them Subcarpathia, “the land before the mountains”. Over the last century this region has been part of six countries, from the Austro-Hungarian empire to the Soviet Union, and has been inhabited by many peoples: Ukrainians, Hungarians, Rusyns, Germans, Gypsies and Jews, lots of Jews who inevitably found themselves at home is such a geographically uncertain place. Jewish life thrived here for three hundred years, as Jews farmed the land and practised many trades that were precluded to them in the rest of Europe. Then came the catastrophe of the Holocaust, which saw most of Jews deported to killing fields or to the gas chambers of Auschwitz. 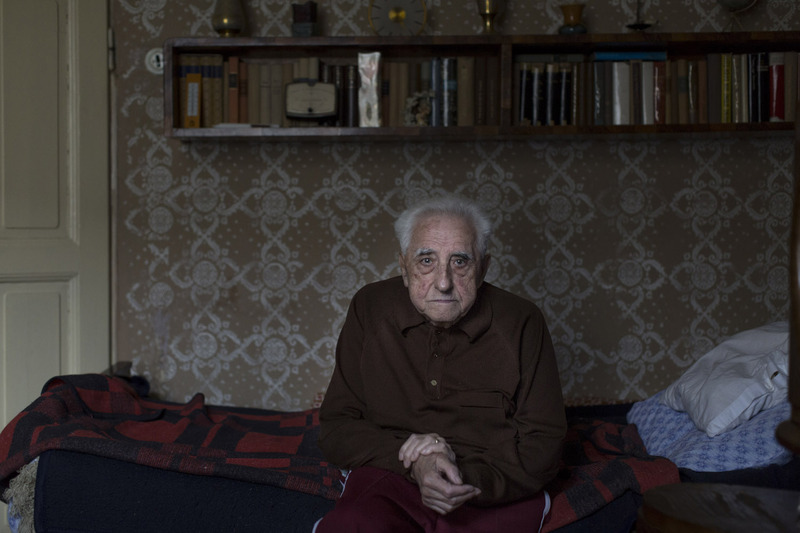 Of those who survived a few decided to return, often in the hope of finding other surviving relatives, and then found themselves trapped within the Iron Curtain of the Cold War. 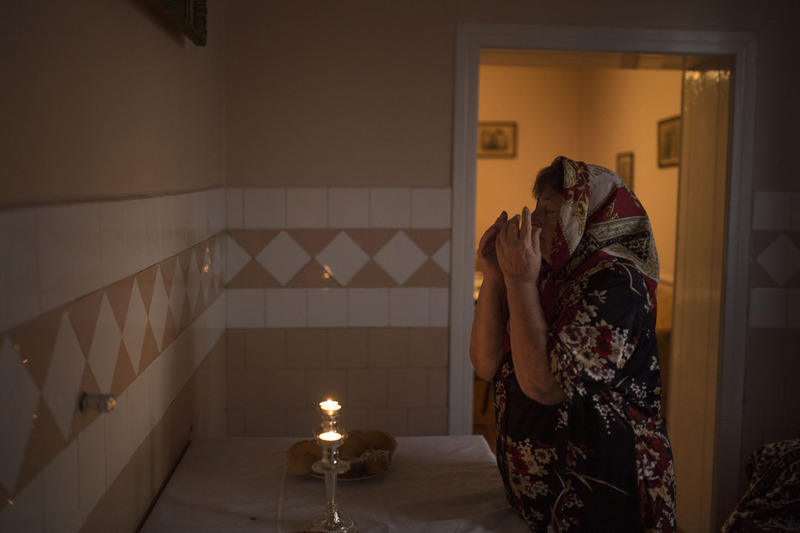 Although Jewish religion and cultural life were forbidden under Communism, the local Jewish communities survived, somewhat reinvigorated by an influx of Soviet Jews. However, when the fall of the Soviet Union reopened the borders, most jumped at the chance to finally leave Europe for America or Israel. 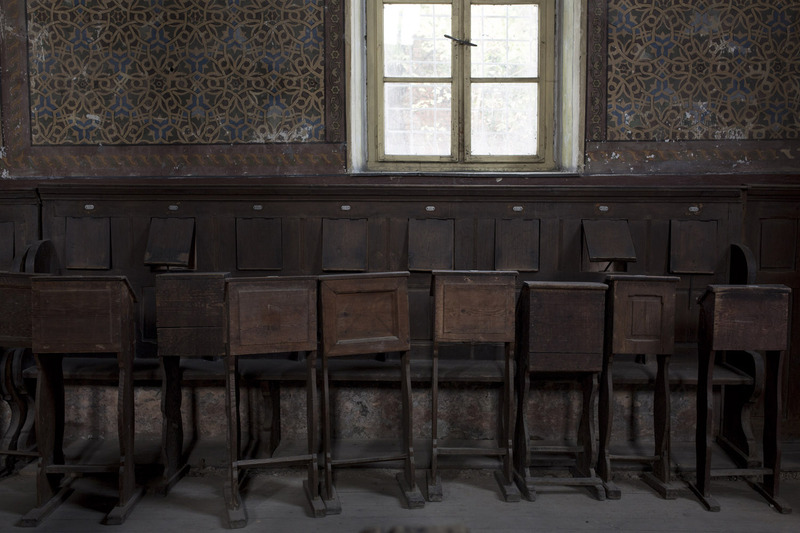 Today, a few thousands Jews remain of what used to be flourishing communities, their synagogues standing empty and often in dire need of repairs. 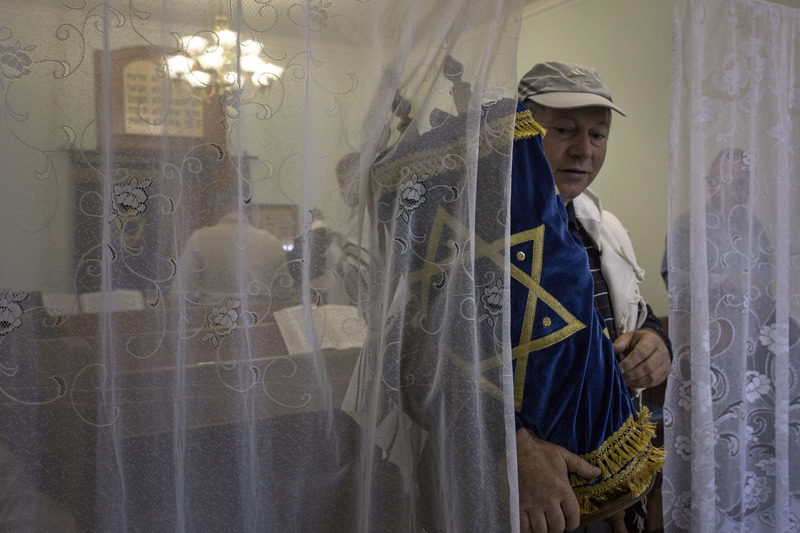 Yet Jewish life somehow carries on: in the towns of Uzhgorod, Vinogradiv, Khust and Mukacheve, whose Yiddish nickname once was "das klein Yerushalayim" (the little Jerusalem), Jews still gather on shabbat and the holidays and try to keep tradition alive, often in their assimilated, half-Christian families. 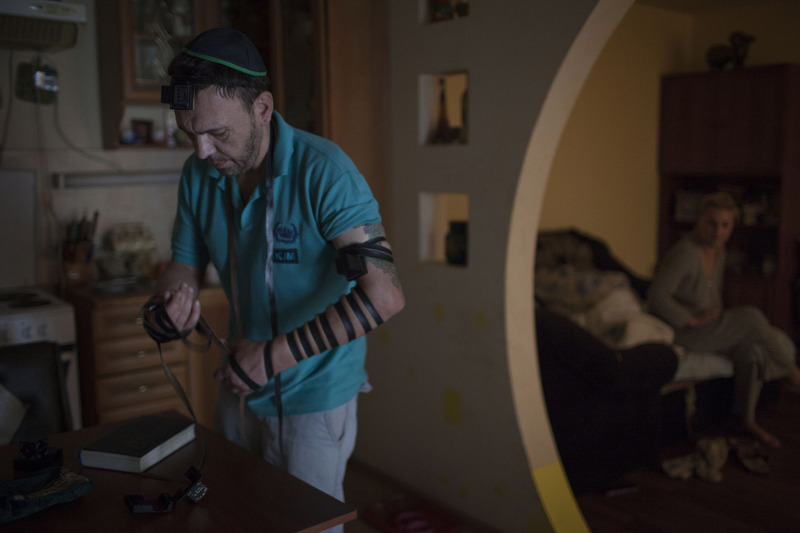 Some have discovered their long-forgotten Jewish roots, while others have begun laying new ones, converting to Judaism or coming from other places. 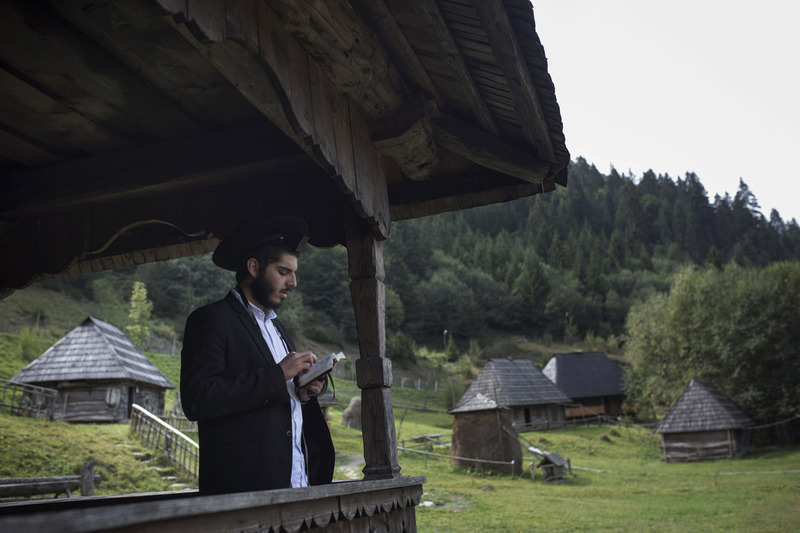 This is the story of the Jewish communities living on the hills and valleys between the Tisza river and the Carpathian mountains.